Are you married and happy? During our state wedding (6 years ago), I was laughing my head off while exchanging the vows. This might have been an emotional reaction to some extent. Yet, I believe it was symbolic of my state of awareness at the time… I had no idea… I was clueless about this whole “marriage thing”… On the 7th of July 2013, I knew all too well though… My six “married” years haven’t been filled with smooth sailing… However, I still believe in this institution, and I still love my husband very much. 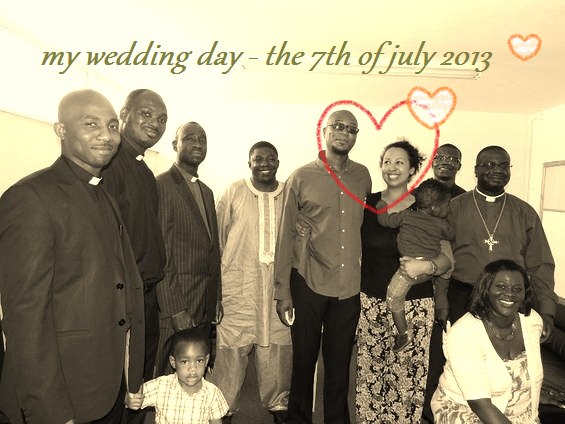 The ministers on the photo are family friendly pastors of The House of Faith, London. God bless them always 🙂 Why so many? You may wonder. Wouldn’t one pastor or priest be enough? It takes two to tango. Necessary and the most important institution of life. No permanent rules, no real principle, we just try to make it work for the past 36yrs 1978 to date. It is never easy. God is your strength. I wish you many more anniversaries.